Every entry submitted to your contest is owned by the person who originally created it until it’s paid for. You automatically own the entry that you select as the winner. If you intend to use other entries from the contest, you must compensate the Creatives who submitted the entry. In case of naming contests, if you want to register additional domain names from your contest, you can do so as long as you pay a $100 bonus to the Creatives who came up with the names. For example, if you register 2 additional domain names (in addition to the winning entry) from a contest, you must pay a bonus of $200 ($100 each) to the Creatives who submitted those names. You can send a bonus to a creative the same way you selected a winner. On your Entries tab, go to the Entry that you would like to select as a bonus. 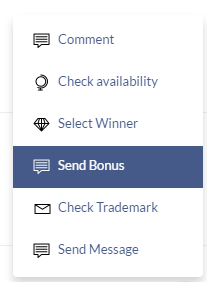 In the Actions drop down, click on the Send Bonus option. A popup window will ask for your payment information. You can also include a message to the creative thanking them for submitting their entry!